To share or not to share, that is the question. By that I mean, do you share a recipe? I find it flattering when someone asks for a recipe. Chances are I didn't invent it or patent it anyway, so don't really feel it's mine not to share. I'm aligned with Molly's perspective which she mentions in her amazing cooking memoir, "Sharing a recipe is how you pay back fate — in the karmic sense, if you believe such things — for bringing something so tasty to you in the first place." The problem is that you need an actual recipe to share something so tasty. Unfortunately, my 90-year old grandmother, whom we call "Monk" and is one of the best home cooks there is, doesn't speak the language of recipes. All her dishes have simply been passed down over the generations. If you ask her how to make something, she tosses around vague directions like, "You just add your wet ingredients to the well and pick up enough flour as needed." In her defense, though, I know she has no idea what the actual metrics really are. It literally is a pinch of salt and a dollop of shortening. I don't recall even seeing her hold a recipe. It's seems about as likely as Superman holding onto a chunk of kryptonite. Her cooking power seems to be within her, like some special gift she's been granted to make people happy — if not a bit heavier — through her amazing cooking. One of the most beloved things I've ever eaten are Monk's buttermilk biscuits. She's famous for them. It's almost holy when Monk brings out a platter of biscuits fresh from the oven. The skies part, the rays of sunlight beam down on them as angels sing hallelujah. Although I've been known to embellish, in this case my description is not far from the truth. 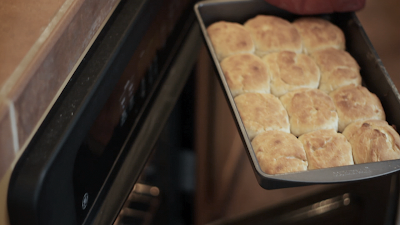 Monk's biscuits are flakey, fluffy, and perfectly kissed by the oven. And each person has their own way to eat them, their own sacred ritual. For me it's just dipped in cane syrup. My mom puts figs on top of hers. My brother sops up his over-easy egg with it. My dad wants his smothered in red-eye gravy. It's nothing out of the ordinary for someone to drive 3 hours just to eat them, and then turn around to go home after breakfast, making sure to take an extra sausage and biscuit to eat on the drive back. As kids, my cousins and I used to tell Monk we were going to sell her biscuits and make millions of dollars. I'm quite sure we could have, but then I think we panicked over the thought of having to share her biscuits with others. We wanted to hoard them. Not very Christian, I know. 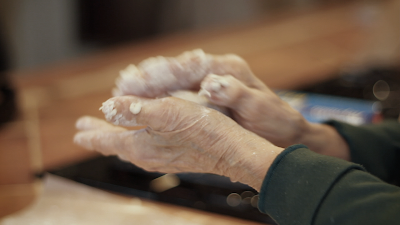 Monk came out to Santa Barbara for my birthday this year, and a friend who's also a filmmaker came over to try some of her famous biscuits and convinced her to let him capture her technique on camera. There are times when you hear a song and it transports you back in time. You can remember where you were, who you were with, what you were wearing. Food can do that too. Sometimes it becomes more than food. It's our childhood, a romantic dinner, a family vacation, a snow day. But Monk's biscuits span my entire life. When I first started this blog, my friend Susan P. asked me if I had a good recipe for buttermilk biscuits. The truth is I had one — Monk's, but I didn't share it with her. I felt for a moment it would be some type of family betrayal. Then I realized my reaction was really just a manifestation of selfishness. Just like when I was 10 and decided I didn't want to sell Monk's biscuits after all. Now that I'm a few years (er, decades) older, I realize that by sharing her recipe I'm really sharing her gift — of love, of coming together to break bread and connect, to pause for a moment in a busy life and appreciate the simple things, to nourish your body, to define your style and respect other's styles, and to have the pleasure of eating something so tasty. Well, Susan, this entry is for you. It took quite a bit of understudying to produce an actual recipe, and I regret to inform you that I think it's more art than science. Or at least a lot of practice is required. I've decided the flour can make or break it. Weird, I know, because flour seems so innocuous. I thought it was more functional than flavorful but I really think it drives the outcome. For me, no biscuit tastes even close to Monk's unless it's been made from White Lilly flour. I can't explain it but it's something I would bet a large chunk of money on. That and I think her biscuit pans add some depth of tastiness and authenticity that I just can't replicate. But I'll keep trying and keep sharing her love. 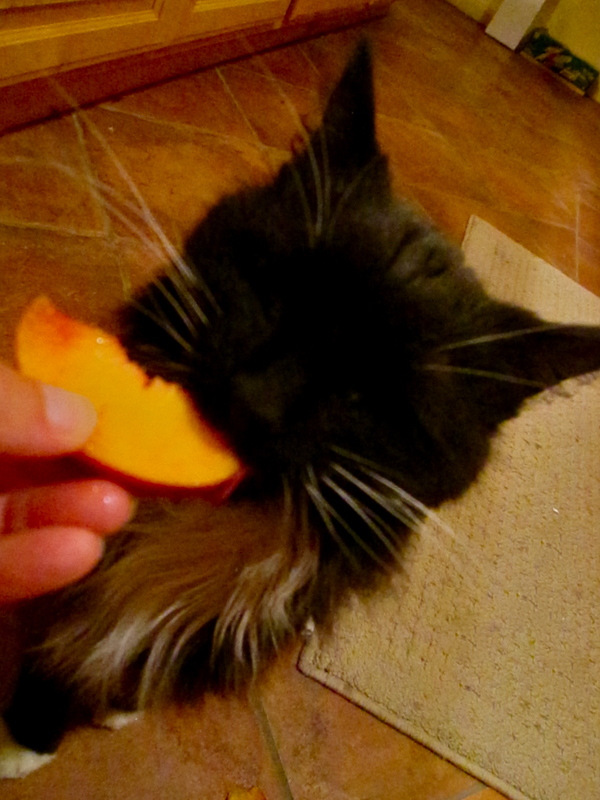 Because nothing is better than seeing someone take their first bite. It makes you feel like you did something good. And you did. It's something people remember for the rest of their lives. Add shortening to 1 1/2 cups flour in a large bowl and mix to combine (will be crumbly). Add buttermilk and mix until combined. Do not overmix. 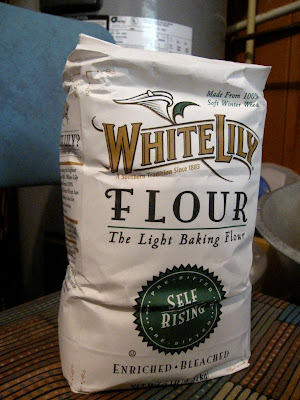 If you need to add more flour, add a 1/4 cup at a time. You want the dough to be just dry enough to turn out of the bowl and onto some waxed paper or a flat surface with some flour sprinkled on it. The dough will pick up the flour it needs. 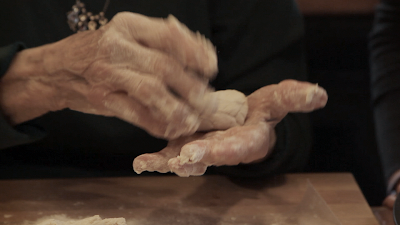 You don't want the dough to be stiff. It should just kind of spread out over the surface; no need to knead it, roll it, or anything like that. But you may have to turn it over or around slightly so you're able to handle it without it sticking all over your hands. The best recommendation I can give you is to watch the above video. 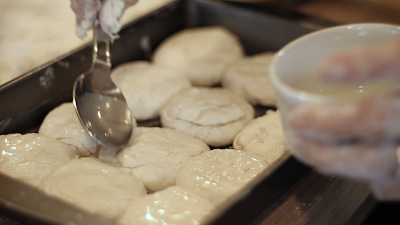 Pinch off enough dough to form a roundish biscuit (maybe 2 - 2 1/2 inches across and 1/2 inch high) and place into a greased pan. I found it's better to pinch off than roll out and cut with a biscuit cutter. Add a dab of melted shortening to the top of each biscuit (just heat up a few Tbsp in the microwave and brush on top) and bake in a 450 degree oven until brown, approximately 20 minutes. You may have to lower the heat to 425 depending on the pan (non-stick seems to cook more quickly on the bottom) and your oven calibration. Also, you might start checking on them at around the 15 minute mark. It's summertime and it's a Thursday, which can only mean one thing: Seersucker Thursdays are in effect on Capital Hill! During the Summer session, the U.S. Senate shows up on Thursdays in puckered pastel suits to beat the heat, a tradition which started in the late 1990s. I guess they couldn't find a big enough veranda to sit out on and drink sweet tea, which is another Southern summer survival tactic. Seersucker is woven with a peculiar combination of tight and slack threads of thin cotton originating from 18th century India. The strange word itself is a mangling of Hindi's "shir shakkar," meaning "milk and sugar," a perfect description of the fabric's smooth and rippled textures. To make the fabric, two kinds of looms are involved; one weaving tightly and one loosely. That shifting creates tiny ridges of bunched threads, so that the fabric is almost held away from the skin. Heat dissipates, sweat evaporates, air circulates, and, one would hope, an idea may penetrate. 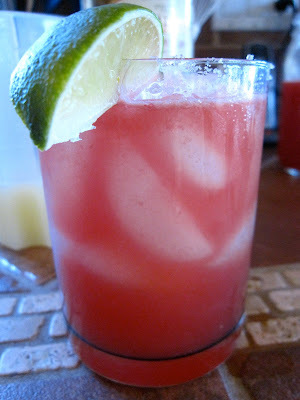 Like how Thursdays are also the the perfect day to drink watermelon margaritas, my new summer adult beverage obsession. The first batch I made was so delicious I felt compelled to go door to door around my neighborhood and hand out samples. It's not everyday someone knocks on your door and hands you lovely libation. 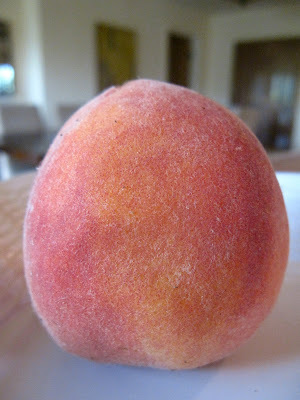 I even begged my friend Karen to drive to my house in rush-hour traffic to have one. Even my cat loved it! 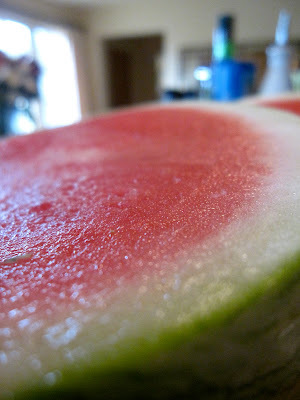 I'd like to point out that today is a Thursday, so I'd highly recommend swinging by a fruit stand or market and picking up a watermelon to create this most refreshing cocktail. Donning seersucker is entirely up to you, but this drink would really complete the outfit and I'm sure would pump up the cooling effect. 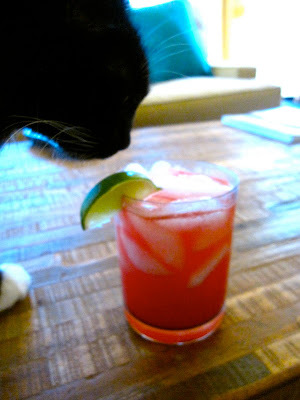 Cheers, to your first of many watermelon margaritas! Because, trust me, you can't have just one of these beauties. In a small saucepan, bring 1/2 cup sugar and 1/2 cup water, along with 3 wide strips of orange zest, to a boil. Reduce to a simmer and cook until sugar dissolves, 3 minutes. Let cool. 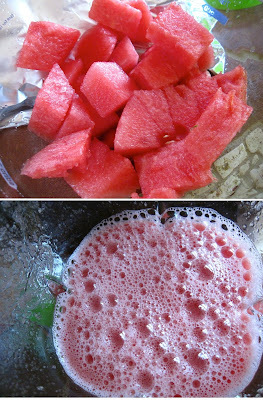 In a blender, puree 2 cups cubed watermelon until smooth. Strain through a sieve, pressing solids, into a pitcher or quart-sized mason jar. You should have approximately 1 cup of juice. Add the sugar syrup, 1/4 cup lime juice (from about 3 limes), and 3/4 cups white or silver tequila. I got closer to 1 1/2 - 1 3/4 cup juice from my watermelon, so you may have to add a bit more lime juice and tequila to even it out. And taste-test it several times (what a burden). Fill salt-rimmed glasses with ice, then pour margarita mixture over top. Garnish with a lime wedge and keep the pitcher nearby. You'll definitely be wanting a refill! Yields: 4 servings, so might as well make a double!